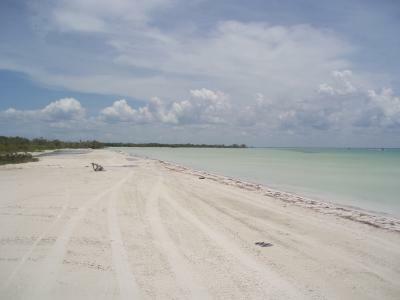 Holbox is an island located to the Northwest of Cancun, Mexico. 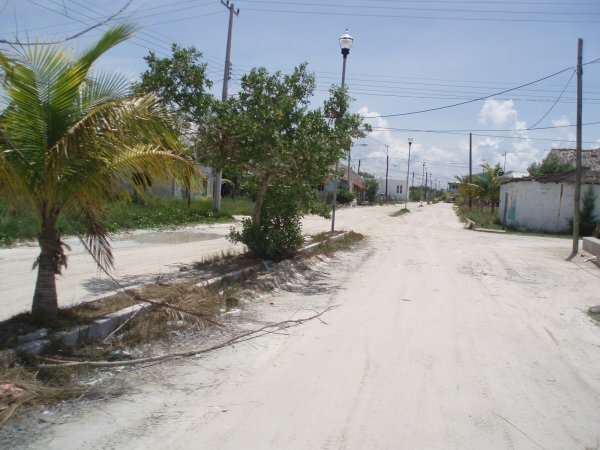 If you are in Cancun and you want to go to Holbox, you would have to drive north for about 1 hour and a half to a small town called Chiquila where you would take a ferry to Holbox for around 40 pesos ($4). Holbox is like another world, everybody seems so relaxed, tourists walking on the sand streets barefooted, friendly people from the island asking if you need anything and offering tours. There are just golf carts in the entire island and you can either walk or rent a golf cart for about $10 per hour and tour by yourself . Bring pesos with you because there aren't any ATM's on the island. like a big pool or lagoon because where i went, you can actually walk into the ocean about 90 ft and the water is still only two feet shallow. The sand is still really thin and really white in the entire island and if you get closer you can actually see fractions of sea shells. There are several hotels in the island with a big price range approximately from $50 per night to $300. Hotels are nice but they keep the relaxed style of the island. There are no huge hotels or constructions. Most of them are like palapas or bungalows that go from ordinary to really fancy but rustic. 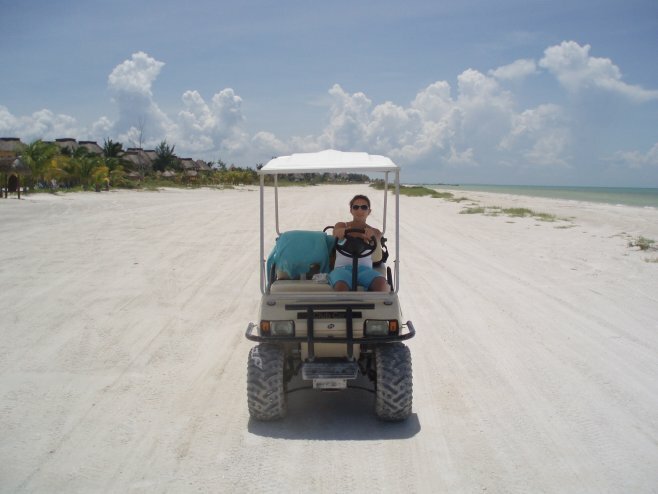 I really enjoyed my trip to Holbox because everything is so natural. No big cars, no traffic, no stress. This is perfect for somebody that wants to take some days off from the daily routine and want to spend some quality time in the nature but having comfort. stay in close to Mexican coasts from May to end of August. Whale sharks are harmless but tremendously big, the biggest whaleshark seen is about 50 feet long which makes them the largest species in the world. They swim around eating plankton and people can actually snorkel and swim next to them. When you take the tour, Fishermen from Holbox take a small group of 6 or 7 people in a boat about an hour and half northeast into the open ocean. You cannot see land anymore, just ocean and some dolphins, suddenly you get to a point where you start seeing little fins and this is very impressive. You cannot believe what you are about to experience. Every minute you keep going you see more and more back fins similar to other shark’s fins. But then, the boad starts going really slow and you realise you are surrounded by whale sharks. 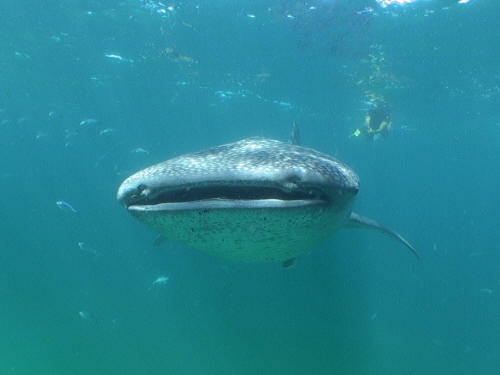 There are many whale sharks, but you never feel afraid because they seem so peaceful. The boat slowly follows one whale shark and people get prepared with their wetsuits or vests, fins and snorkel ready to jump to the water whenever the captain tells you. 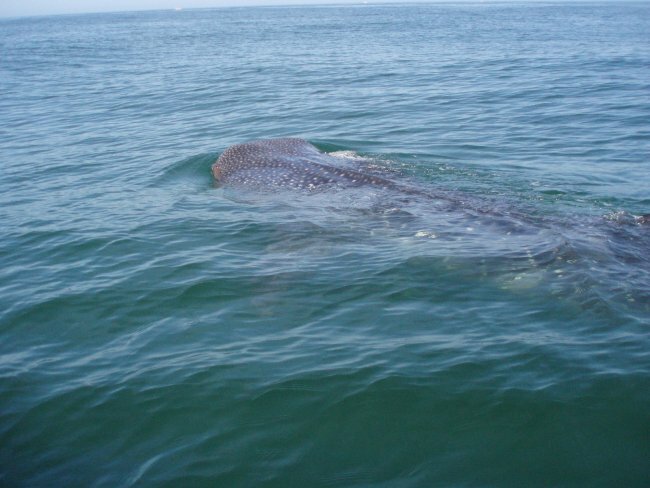 The boat stops close to the path the whaleshark is taking (they usually swim in big circles) and then you jump! Your heart starts speeding because you do not know what you are about to see and suddenly your vision clears up and you see it coming: a huge animal coming towards you with its mouth open and seriously you could easily fit in their mouth but they come slowly to you, and then when they sense you are there they just turn either right or left and keep swimming, you now have to start swimming as fast as you can so you can catch up with them and admire their beauty. They have big fins and they are also called domino because they have some sort of squares with white dots. After jumping into the water to chase the whale shark for several times you go back in the boat get some fresh water and a snack. Then you start coming back to Holbox and stop nearby the Isla Pajaros so you can see all the pelicans. When you come back to Holbox and you are tired and hungry the best thing to do is to stop at one of the fine restaurants near by the beach and eat a delicious sea food meal. My personal recommendation would be fresh Lobster for as little as 20 dollars or Lobster pizza which is really really good!! I am definitely going back next summer! 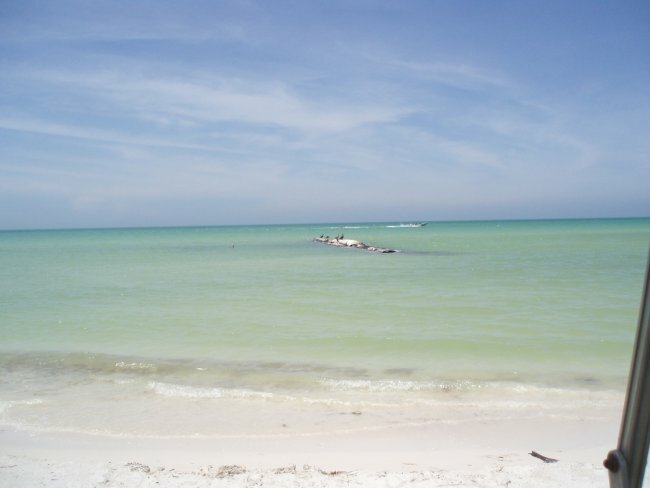 I am planning a trip this summer to Holbox. Your trip description really helped me get an idea of what I am going to experience. Thanks!